Putney in south west London lies within the borough of Wandsworth and is located on the southern bank of the River Thames. The starting point for The Boat Race, held annually on the last weekend in March or first weekend in April, Putney’s riverside setting makes it a most desirable part of the capital in which to to live and the area boasts a wealth of restaurants and pubs with private dining rooms available for events. 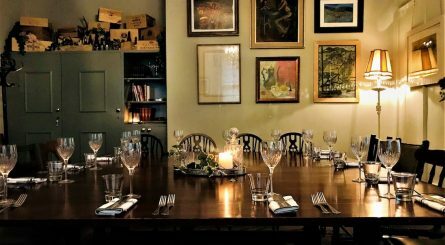 The private dining room at the Prince of Wales gastro pub in Putney accommodates up to 22 seated guests and is also available to hire for standing receptions of up to 30 guests.